288 precious souls in Ginoog City. 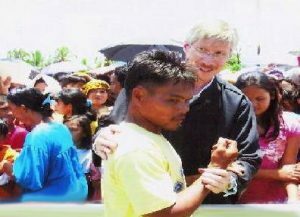 Two baptisms happened on March 22, 2008 in Northern Mindanao Conference. 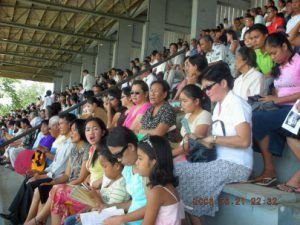 One in Cagayan de Oro City – a result of a Mega Evangelistic Effort (a Happy Family Life Seminar) given by Pastor Albert Gulfan, President of Southern Asia Pacific Division. There were around 1,900 precious souls who accepted Jesus through baptism that day. 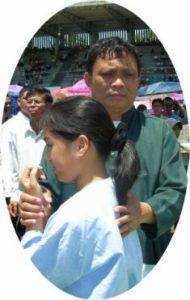 And to have a place for the large number of people, the baptism was held in an open area where several standing water pools were placed. 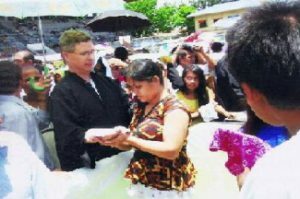 On the same day, March 22, another mass baptism was also taking place 76 miles away in Gino-og City – a result of an evangelistic effort under the leadership of Pastor Jemer Cabahit and also some guests from Canada. They had tremendous success and for first time in the Gino-og Area, they had a baptism of 288 precious souls on that day. 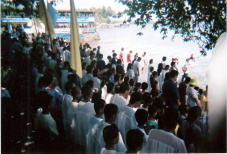 sabbath worship when mass baptisms was held in Northern Mindanao. We thank the employed ministers of NMC, the adopted ministers of AMI, and the brethren of Northern Mindanao Conference for their many months of hard groundwork that resulted to the great success of both mass baptisms. And we thank the “Adopt a Minister International” sponsors for their financial support and prayers.